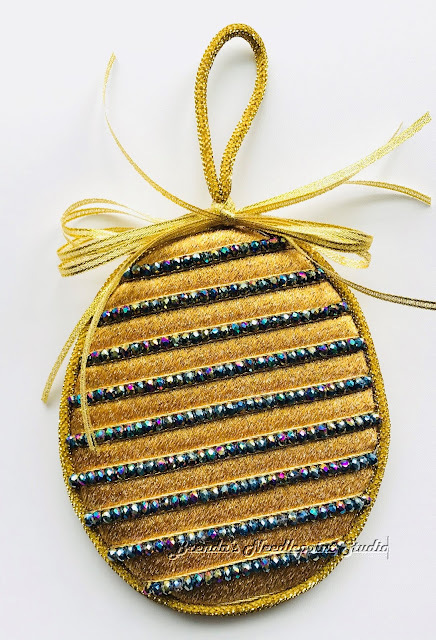 April 25, 2018--The Theo Faberge's Jeweled Spiral Coil Egg is now "finished" into an ornament. This one was a real challenge to put together--had to remove some extra beads that were hanging over the edge, then had to deal with the white beading thread that was showing. 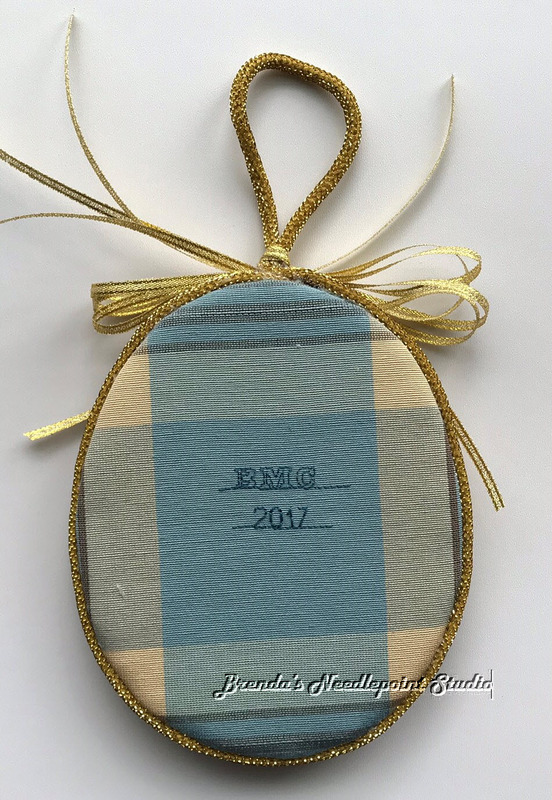 Took my cue from the couture houses--when you make an error, cover it up, cut it out, or incorporate it into the design. In my case, I used the "cover it up" principle. Won't say where (LOL). I love the plaid fabric on the back. In person, the color is a lot more intense and shiny. BTW, the dark lines on both sides of the backing fabric are part of the design, not gaps between the edge and cording. All in all, I think it looks nice. 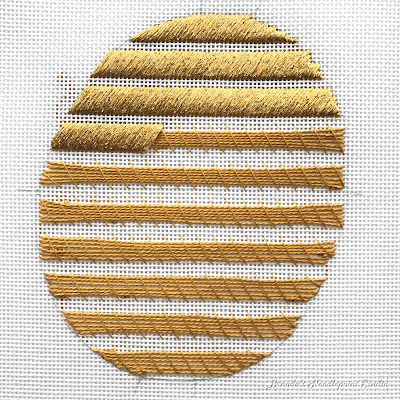 February 17, 2017--Completed the stitching, beading and thread couching on this beautiful needlepoint version of Faberge's Jeweled Spiral Coil Egg. The multi-colored beads really sparkle. January 27, 2017--Finished laying the gold ribbon and am beginning the beadwork. The first picture below shows how the egg looks with the canvas threads running true vertival. The second picture shows it slightly tilted to have more of an egg shape. This is how it will hang when finished. 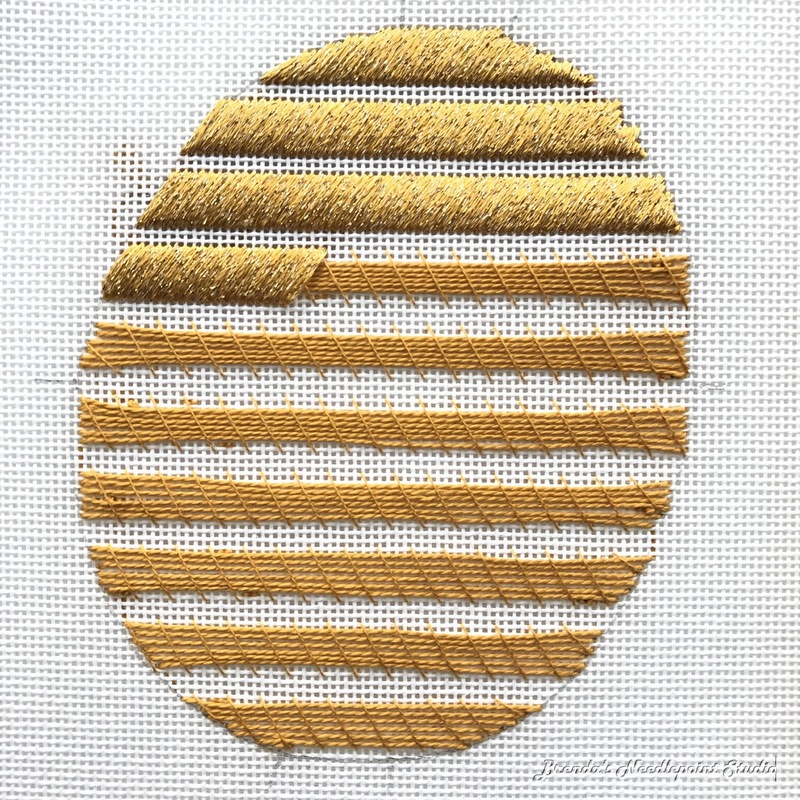 The purpose is to visually reduce the slant of the gold ribbon diagonal lines while making the beads look like they are coiling sideways around the egg. January 15, 2017--This is one of the classes I took while at ANG's 2016 National Seminar in New Orleans, LA. It's called Theo Fabergé's Jeweled Spiral Coil Egg and is designed by Michele Roberts, known for beautiful goldwork projects. I haven't had an opportunity until today to resume working on this piece. Here's what I accomplished in class. Facinating couching technique. I'm surprised that you didn't get a row of beads in during class. I guess there wasn't any pre-work. Michele's eggs are beautiful. Very interesting seeing the layer below. I took a look at the finished piece and it's gorgeous. What kind of beads and metal threads are used? The beads used on this piece are Rainbow Aurora Borealis 3 mm x 4 mm rondell-shaped crystals on long strands. The metallic thread is RG Neon Rays Plus. It SHINES!